•Single phase induction motor is mostly used in home, office, shop and many single phase appliances like pumps, ceiling fan, washing machine etc. •Single phase induction motor is less efficient than three phase induction motor but three phase power is mostly available in large industrial places. 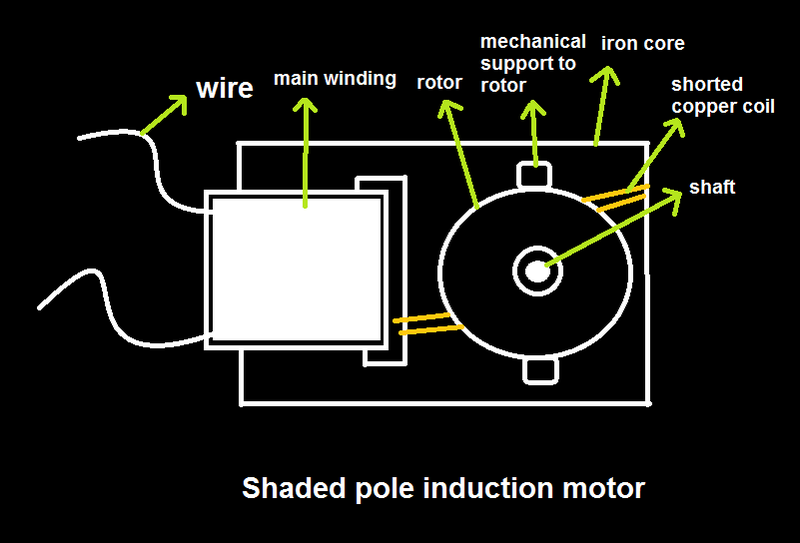 •Single phase induction motor is not self starting motor. •Single phase induction motor have one main winding in the stator with this winding by adding another winding (auxiliary or starting) and resistance or capacitor in series or parallel we can make single phase induction motor self starting. 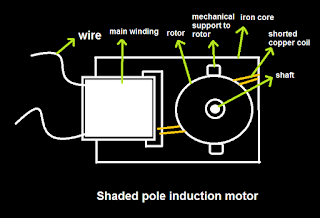 •Shaded pole motor looks like a transformer with motor actually induction motor is a rotating transformer. •An auxiliary winding is copper ring surround each pole added with main winding for starting purpose. •When the current flows through auxiliary winding it produces flux which is unequal. 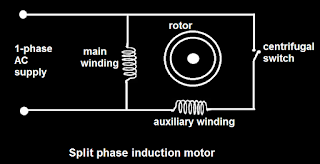 •Flux in shaded pole and in unshaded pole opposes the main winding flux which rotates the rotor. •Stator have salient poles and short circuited copper turn called shading coils. •The rotor of shaded pole motor is squirrel cage rotor. •Shaded pole motor is less costly. •Split means break up or divide. 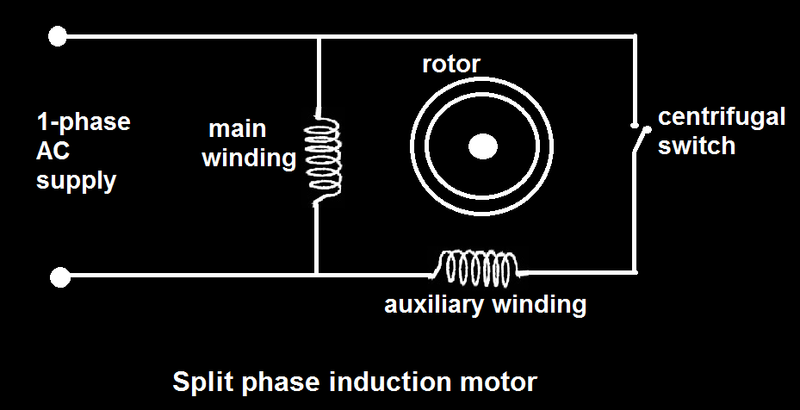 •Split phase induction motor consists of main winding and auxiliary winding or starting winding and a centrifugal switch. •Starting winding is placed at 90 degree electrical with main winding. •Centrifugal switch is on at starting and it splits the auxiliary field winding when the motor start running. •Main winding have low resistance and high reluctance and auxiliary winding have high resistance and low reluctance. 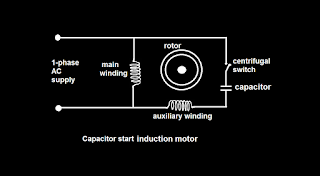 •Capacitor start induction motor is similar to split phase induction motor but starting torque of split phase induction motor is less so by adding a capacitor in series with centrifugal switch and making similar electromotive force in main and auxiliary winding. •So it makes capacitor start induction motor more costlier than split phase induction motor. •The capacitor is electrolytic capacitor whose value is about 3 to 20 micro farad. 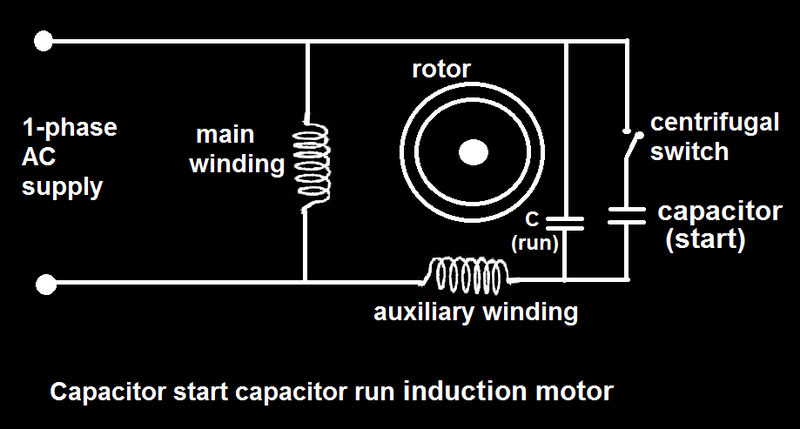 •Capacitor start induction motor is use where high starting torque is required. 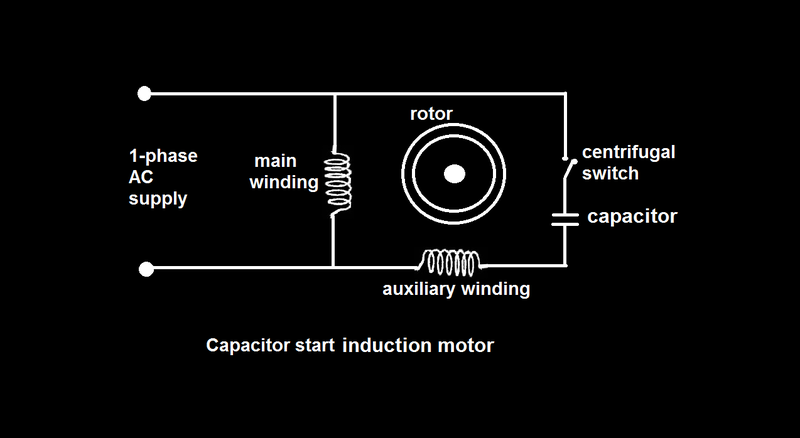 •Capacitor start induction motor is use for fan, pumps, compressor etc. 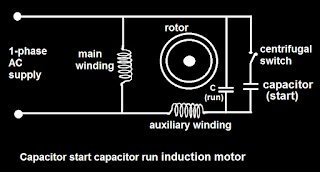 •Capacitor start capacitor run induction motor works like three phase induction motor at some point. •Consists of two capacitor one in series with centrifugal switch (capacitor start) and one in parallel (capacitor run). •The capacitor run is disconnect after starting of motor but capacitor run is still connected via auxiliary winding. •This gives better power factor and improves efficiency. •Capacitor start capacitor run motor have smooth torque and silent operation. •It is uses where silent operation is required.